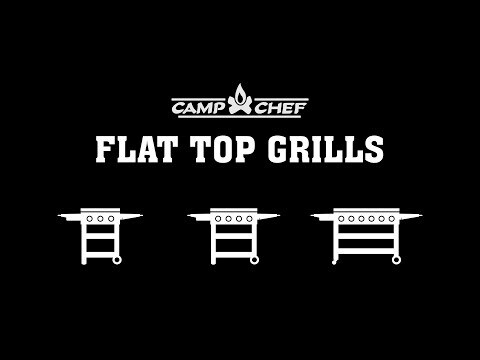 For the person who has more to cook than what they can fit on their stove, or the grill master who wants an egg on their burger, the Camp Chef 600 Flat Top Grill is the versatile and ideal solution for any outdoor cooking event. The 604 square inch, pre-seasoned, cold-rolled steel cooking surface features a splash guard to keep food on the griddle, and is evenly heated by four 12,000 BTU stainless steel burners. The burners sit in a powder coated steel burner box and are independently controlled by four knobs on the front of the grill. As you cook, drippings will flow into the grease tray at the edge of the griddle top, and then funnel into the grease catch bucket. Two large, powder coated steel folding side shelves provide extra prep space, and two powder coated steel shelves under the grill provide storage space for tools or utensils. Micro-adjust griddle levelers and adjustable leg levelers insure that you always have an even surface to cook on. Serve up grilled burgers, steaks, chicken and more using a full set of grill grates below the griddle plate. A hose, regulator, and holding bracket are included for a 20-pound propane tank (tank not included). Cooking Grid Dimensions 31 25/32 X 19"
31 25/32 X 19" 27 1/2 X 18" 27 1/2 X 18" 33 X 21"